It never ceases to amaze me how our friends in Eircom are so happy to pass the buck when it comes to the terrible Zyxel D1000 especially when in Bridge Mode. 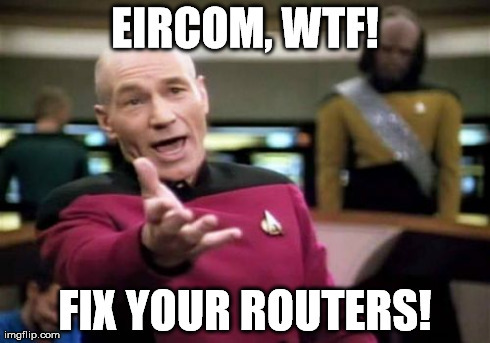 Its easy for Eircom to say that they do not support bridging, but the reality is that most customer want to avoid a double NAT situation. Bridging should work, and I have found a trick that makes it work – its really weird. On the other 50% of the devices we have setup here, the only way to make the bridge mode work is to configure it via the WAN connection (remote access). The exact same settings as above, but over the WAN port. <<< this is insane, for the record. So, there you have it. Its on the web now, so it must be a)true* and b)helpful* to some poor person sometime in the future. @nickwhittome i will bet you it is better than the french router i worked on a while back. What I found works is to first set the Mode to “Router” in Broadband settings, then change encapsulation to PPPoE, and press Apply. 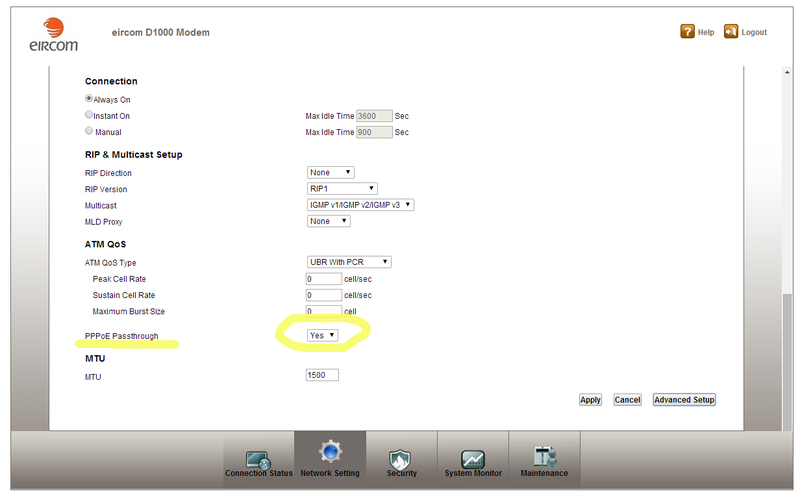 Now – change back to Bridge mode, apply settings, and it should keep the PPPoE setting, even though it’s not displayed. A major problem with this however is that if you lose power to the mode, it loses the PPPoE setting, so you have to do the process again – switch back to Router mode, apply etc. then back to Bridge and apply. A better solution is perhaps to try to use the mysterious “IPoE” in bridging mode. This probably just needs DHCP setup on the interface where you would normally have the PPPoE client attach to (i.e. ppp0 on a Linux box). Actually – just found an easier option for PPPoE bridging. If you set the mode to Router, then go to Advanced Setup, way down at the end of the page there’s a “PPPoE Passthrough” option. Set this to yes and you can run the normal PPPoE clients on connected devices in a bridge-like fashion. Also, it keeps this config after losing power.